What Did the Dow Jones Industrial Average Do Today? Subject: What Did the Dow Jones Industrial Average Do Today? six − 5 = Required Please enter the correct value. 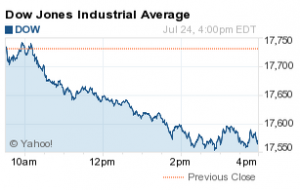 Today, the Dow Jones Industrial Average fell 163 points on the day, extending the index's losing streak to four days. A sharp decline in materials and healthcare stocks and a decline in commodity prices offset strong earnings reports by Amazon.com Inc. (Nasdaq: AMZN), Visa Inc. (NYSE: V), and Starbucks Corp. (Nasdaq: SBUX). The S&P 500 Volatility Index (VIX), the market's fear gauge, gained 12%. Stock Market News: The markets slipped today as the basic materials sector took a big hit and new home sales fell to a seven-month low. The decline in home sales was a bit of a blow to the industry and puts the sector's recovery in a holding pattern as the summer buying season continues. Shares of R. Horton Inc. (NYSE: DHI) slumped more than 2.5%, Ryland Group Inc. (NYSE: RYL) fell nearly 3%, and Lennar Corp. (NYSE: LEN) dipped 3.6%. Oil Outlook: Oil prices slumped to their lowest levels since March as traders worried about oversupply on the global markets. WTI crudefutures for September fell 0.6% to hit $48.15 per barrel. Meanwhile, Brent oil prices slipped 1.3% to hit $54.73 per barrel. Both U.S. and Brent crude are on pace to post monthly losses of more than 10%. On Tap Next Week: On Monday, earnings week continues and speculation about a pending rate hike by the U.S. Federal Reserve will be in full swing. The economic calendar for next week is relatively light with the exception of a very important Q2 GDP reading on Thursday. Companies reporting earnings on Monday include Baidu Inc. (Nasdaq: BIDU), Sohu.com Inc. (Nasdaq: SOHU), Norfolk Southern Corp. (NYSE: NSC), Rent-A-Center Inc. (Nasdaq: RCII), Roper Industries Inc. (NYSE: ROP), and PolyOne Corp. (NYSE: POL). Stocks to Watch No. 1, T: After one year of review, the Federal Communications Commission (FCC) formally approved the $48.5 billion merger between AT&T Inc. (NYSE: T) and DirecTV (Nasdaq: DTV). This deal combines the nation's second-largest wireless carrier with the nation's largest satellite-TV provider. The deal officially makes the combined firm the largest pay-TV company, surpassing Comcast Corp. (Nasdaq: CMCSA). Shares of DirecTV were up 1.5% on the day. This morning, AT&T reported adjusted quarterly per-share profits of $0.69, beating Wall Street estimates by $0.06. The firm credited a boost in its customers for the quarter for the surprise earnings report. Shares of AT&T were up 1.5% on the day. Stocks to Watch No. 2, AMZN: Shares of Amazon.com Inc. (Nasdaq: AMZN) finished up more than 10% on the day (and rose as much as 20.4% during today's trading session), after the company shattered quarterly profit expectations. For a brief period, the firm's market capitalization hit nearly $270 billion, surpassing retail giant Wal-Mart Stores Inc. (NYSE: WMT). Yesterday, Amazon reported that quarterly revenues hit $23.185 billion, up from $19.34 billion in the same period last year. Stocks to Watch No. 3, ANTM: Shares of Anthem Inc. (NYSE: ANTM) slipped 2.8% after the company officially announced it would purchase Cigna Corp. (NYSE: CI) in a deal worth $188 per share. The deal will create the nation's largest health insurance company and reduce the number of large players in the industry from five to three, following additional consolidation in the sector. Once combined, the new company will insure 53 million customers and generate revenue of $115 billion. Stocks to Watch No. 4, SFG: Shares of Stancorp Financial Group Inc. (NYSE: SFG) surged more than 47% after the company agreed to be acquired by Japan's Meiji Yasuda Life Insurance for $5 billion. Stocks to Watch No. 5, TRUE: Shares of Truecar Inc. (Nasdaq: TRUE) fell more than 35% after the online car-shopping firm slashed its 2015 revenue outlook following a brutal conference call in which to company said it expected a loss of up to $15.5 million. Is Netflix Stock a Buy After Stock Split and Earnings Beat?